BEATLES - *COUNTER TOP DISPLAY*. 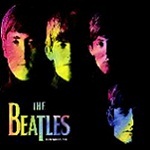 Contains a complete set of Beatles Chu-Bops *GUMS* (Numbers B1 - B16). All gums are in their original factory sealed shrink wrap with the gum inside. None of the 64 Gums have any bleed-throughs or creases. The *BOX* is in excellent condition with vealmost no anomalies (normal handling and age). No discoloration or fading on either the Gums or Display Box. All the \\\"parts\\\" to the box are included: Bops Holder, Center Divider, \\\"stairsteps\\\", Album box cover. I guarentee you tottal satisfaction ! 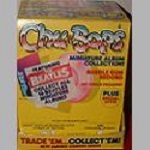 SERIES ONE - *16 MINT CONDITION CHU-BOPS* Never Opened, Factory Shrink Wrapped with gum inside. No discoloration or fading on the albums. The Box and all the parts are MINT. This item has never been on a counter top. It was purchased from a man who uesed to work at amurol - STUNNING ! *REMINDER, ALL ORDERS OVER $40.00 Includes FREE Shipping and Tracking*. 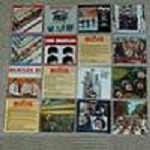 BEATLES - *SET OF 16 OPENED CHU-BOPS* There is No shrink wrap or gum inside. Can be opened to view pictures, or artist related factoids. Albums have masive *Bleed-Through* on the back side. The FRONT of the albums are in very good condition. Great for the FIRST TIME BEGINNERS. NO REFUNDS on this item. PLEASE GO TO OUR *COLLECTIBLES AND MEMORABILIA* PAGE TO VIEW *ELVIS-BEATLES* MONOPOLY BOARD GAMES, AND ROLLING STONES MEMORABILIA. IF ITS ROCK-N-ROLL YOU ARE COLLECTING, I HIGHLY RECOMEND YOU VISIT OUR PAGE. HAPPY BOPPIN !